Vita Spa distributor Aqua Warehouse Group, which also supplies L.A Spas models to UK dealers, has reported a major surge in demand for swim spas that is being serviced by increased deliveries from MAAX Spas Corporation. Dealer Manager Graham Message reported that, along with a large increase in new hot tub customers, there had been a massive jump in swim spas sales during 2015, as demand for the Vita Spa xStream range, which has been boosted by a WhatSwimSpa? Best Buy Award accolade for the XPS, has increased significantly compared to the previous 12 months. “Along with producing a lot more sales of hot tubs than last year our dealer network has also helped to massively increase our overall swim spa sales compared to last year,” revealed Graham. “Our Vita Spa sales increased by 30 per cent in 2015 with the Prestige being the clear winner in the hot tub sales chart. 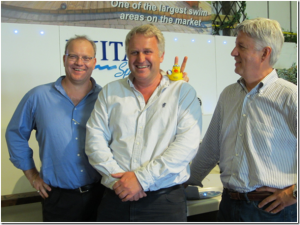 We’re also pleased to report that our sales of swim spas have increased significantly by 46 per cent this time round. We’ve now got container deliveries constantly arriving to meet the demand. He believes the new Northern Exposure 3M Thinsulate insulation will provide a major boost for Vita Spa hot tub dealers this year and beyond. The new design technology, which will also be available for L.A Spas models, was officially launched on the Aqua Warehouse Group’s stand at the UK Pool & Spa Expo in November and promoted to current dealers of both brands in January. Graham reported that it had created a positive reaction from L.A Spas and Vita Spa dealers during their respective two-day Dealer Seminar events hosted by Aqua Warehouse Group last month ahead of this week’s successful second SPATEX outing for its Aqua Spa Supplies division during the 20th anniversary edition of the wet leisure extravaganza. “Everyone is aware of this insulation brand due to it being so popular in outdoor clothing and hats and gloves,” said Graham. “So it is naturally causing a great deal of interest, especially as dealers can see the potential it has for marketing and promotional purposes, as well as providing unique features to prospective customers to help to secure sales. “Copper will also be used to replace the previous silver insulation capability and it is going to significantly increase the insulation capabilities along with the Thinsulate technology. I never thought that we could improve on the existing insulation but we have certainly done that now and taken the next step of taking it up another level. Aqua Warehouse Group chief Richard Hart reported that he was delighted with the performance of the newly acquired L.A Spas dealer network that had produced increased sales in 2015 despite the late arrival of stock to the UK, following the acquisition of the brand by MAAX Spas the boost of a WhatSpa? Best Buy Award in the £4,000 to £5,999 price range for the six-seater Belmar LX. “We were very pleased to report to our dealers at the L.A Spas Seminar that they had increased their annual sales total and our overall sales for the UK were 30 per cent up on the previous year,” said Richard. They had the opportunity to meet MAAX Spas CEO John Johnson, pictured on the left, who was among the manufacturing giant’s VIP representatives during the two Seminars that also included the attendance of Director of Business Development James McClure, pictured on the right, who has helped to support Richard, pictured centre, on his exhibition stands in recent years including the UK Pool & Spa Expo in November, which has since been renamed the Hot Tub Living Expo. “There’s nothing better if you see dealers walking out of your seminar events feeling upbeat and positive for the year ahead,” enthused Graham. L.A Spas UK Representative Sean Aldred, who also attended the L.A Spas Seminar event, reported that the brand had enjoyed a good start to the New Year and additional swim spas sales had also been recorded. “We did very well last year and we got off to a good start in January with swim spas included in our sales,” revealed Sean. “Last year we had to deal with all the changes but we still achieved strong sales with our L.A Spas hot tubs and swim spas. We didn’t get stock arriving until April so to achieve the results we did has been amazing. “It has been difficult because of the transition, but we’ve not lost one single dealer in the process, so it has also been good for us on that front as well. “The feedback we’ve been getting has been fantastic and our dealers are really buzzing. They can’t wait to get the new models that include the new Thinsulate material in the insulation process.